(Kilauea Point, Kauai) – “An enormous success,” is how people and organizations involved in an effort to further protect endangered Hawaiian seabirds describe the first two seasons of translocating Hawaiian Petrels and the first Newell’s Shearwaters to a predator-proof enclosure at Kīlauea Point National Wildlife Refuge on Kaua‘i’s north shore. 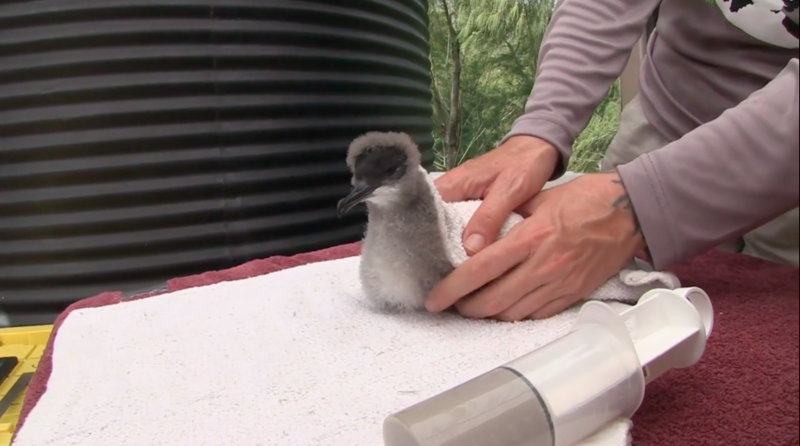 The effort is a collaboration among the Kaua‘i Endangered Seabird Recovery Project (KESRP), Pacific Rim Conservation, American Bird Conservancy (ABC), the Hawaiʻi Department of Land and Natural Resources’ Division of Forestry and Wildlife (DOFAW), and the U.S. Fish and Wildlife Service. KESRP is a DOFAW/Pacific Cooperative Studies Unit project. Other partners also provided much-needed assistance for the project. The Kauaʻi Island Utility Cooperative provided critical support for predator control in collaboration with DOFAW at montane nesting areas within the Hono O Na Pali Natural Area Reserve and the National Tropical Botanical Garden (NTBG) at Upper Limahuli Preserve. NTBG also conducted vegetation restoration at Nihokū, where the fence is located in the refuge. The National Fish and Wildlife Foundation provided critical funding support. The Kaua‘i DOFAW Natural Area Reserve team also provided on-the-ground support. “We hope that residents of Kaua‘i, folks from around the state, and Hawai‘i’s millions of visitors, along with people the world over will appreciate the scope of this management tool and partnership as a critical step toward reversing the decline of both Hawaiian Petrels and Newell’s Shearwaters,”concluded Heather Tonneson, of the U.S. Fish and Wildlife Service’s, Kīlauea Point National Wildlife Refuge.